Colorado is represented in Congress by 2 Senators and 7 Representatives. Colorado Senators represent all of Colorado. Colorado's 4th congressional district is located in the eastern part of the state, the district encompasses most of the rural Eastern Plains as well as the larger city of Greeley, Lamar, and Castle Rock along Colorado's Front Range in eastern Colorado. Colorado's 6th congressional district is located in central Colorado, the district encompasses much of the southern part of the Denver-Aurora Metropolitan Area, including the suburbs of Littleton, Centennial and portions of Aurora. Redistricting in 2012 added some suburbs to the north of Denver including Brighton and Henderson. Colorado's 1st congressional district is based primarily in the City and County of Denver in the central part of the state. The district includes all of the City and County of Denver and the nearby suburbs of Glendale, Englewood, Sheridan, and Cherry Hills Village. Colorado's 5th congressional district is lies in the center of the state and mostly comprises Colorado Springs and its suburbs including Cimarron Hills and Fort Carson. Colorado's 7th congressional district is located in the central part of the state, the district encompasses much of the northern and western parts of the Denver-Aurora Metropolitan Area, including Golden, Lakewood, Arvada and Westminster. Colorado's 2nd congressional district is located in the north-central part of the state and encompasses the northwestern suburbs of Denver including Boulder, Northglenn, Thornton, and Westminster. The district also includes the mountain towns of Vail, Grand Lake and Idaho Springs. Redistricting in 2011 has moved Larimer County, including the cities of Fort Collins and Loveland, to the 2nd from the 4th district for the 2012 election. Colorado's 3rd congressional district is located in western and south central Colorado, encompassing most of the rural Western Slope. It includes the cities of Grand Junction and Durango as well as southern portions of Colorado's eastern plains, including the city of Pueblo. 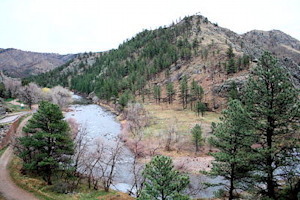 Gateway Park Natural Area on the Poudre River Gateway Natural Area at the confluence of the North Fork of the Poudre with the main flow of the Poudre River, being close to Fort Collins, is a favorite fishing site of many Rocky Mountain Flycasters (RMF) members. It also is the graduation site for RMF’s River Conservation & Fly Fishing Youth Day Camp. Gateway is one of City of Fort Collins Natural Areas, a collection of special places in and near Fort Collins that provide public access to over 32,000 acres of natural areas. Recently the Fort Collins Natural Areas management staff invited the RMF Board of Directors to consider participating in any of several candidate activities supporting the management of Natural Areas. Your Board decided that Gateway is the Fort Collins Natural Area most relevant to RMF members’ interests. More specifically, RMF has entered into an Adopt-a-Trail agreement with Fort Collins in which RMF volunteers participates in foot-trail maintenance within the Gateway Natural Area. This activity is similar to the trail maintenance work that RMF volunteers have conducted during the past 6 years at Larimer County’s Eagles Nest Open Space. So, Gateway is an addition to what RMF volunteers are already doing to protect and maintain trails in our nearby public lands natural areas. A work schedule for 2014 has not yet been set but you can see more details from previous work on the Gateway page. We are looking for a Gateway Volunteer Coordinator for this year. The time commitment is not extensive but the rewards are enormous. See our Volunteer page for additional details. Volunteers help the Park Law Enforcement Ranger inform the Public of the “Catch and Release” and barbless hook regulations at Lily Lake and help enforce the spawning area closure during spawning season. Volunteers wear the National Park Volunteer uniform and work on a chosen day of the week, either morning, afternoon or evening patrol from May through August. You set your schedule and there is flexibility if you need to skip a week. Contact Austin Condon at AWCFlash@AOL.com if you are interested in helping at Lily Lake.